Home » Namkeen » Bikano Namkeens: Perfect Options To Savour In Between Meal Times! Bikano Namkeens: Perfect Options To Savour In Between Meal Times! As quotes by a learned man, “There’s no diet that will do what eating healthy snack does.” It is believed that eating between meals is a ‘bad habit.’ However, studies have shown that snacking in between meals is an effective way to add extra nutrients into your diet. It helps to prevent overeating thereby, maintaining the right body weight and controlling the chances of obesity as well. The health benefit of having healthy nutrient-based, light snacks and namkeens between meals is basically two-fold: Firstly, it helps to keep the body metabolism up for greater fat burning. When one goes for more than few hours without eating, it tends to lower the metabolism function of the body and conserves calories rather than burning them. Secondly, eating healthy, light snacks such as those offered by Bikano, help to untimely prevent hunger pangs that often become a cause of overeating later. 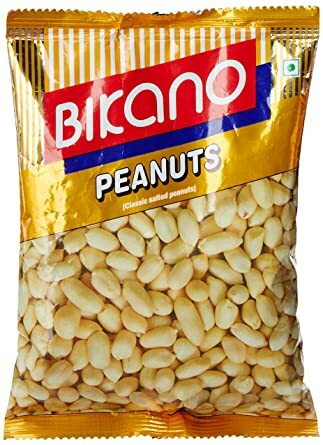 Many confectioners of India such as Bikano offer healthy snacking items which serve the above-defined purpose. If you’re someone who resents eating in between meals, it’s time to change. Opt for light, filling and full of nutrients Bikano sweets and namkeens. It’s what your body needs and you do too! Moong Daal and Daal Mooth — The amazing mixtures of Daal Mooth and Mung Daal offered by Bikano are simply scrumptious. Not only they speak of rich sources of proteins, but they are highly rich in vitamins and contain low calories as well. Peanuts – Peanuts are highly rich sources of energy and boast of good levels of proteins, minerals, and antioxidants which perfectly satiate hunger pangs in between the meals. Shop online with Bikano today! Chana Pataka – Chana is highly beneficial in losing weight, lowering cholesterol level and helps in stabilizing blood sugar levels in the body. 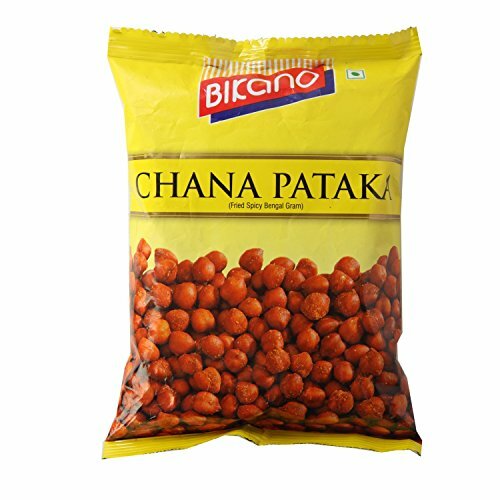 The crispy and spicy Chana Pataka offered by Bikano promotes many health benefits and is an excellent namkeen option for all namkeen lovers! Aloo Bhujiya – The crispy, light, tangy, and spicy vermicelli shaped Aloo Bhujiya is prepared using top quality, handpicked potatoes. Not only it’s a perfect tea time accompaniment, but also offers loads of essential nutrients in varying quantities, such as Vitamin C, Potassium, Copper, edible acids and many important dietary fibres. 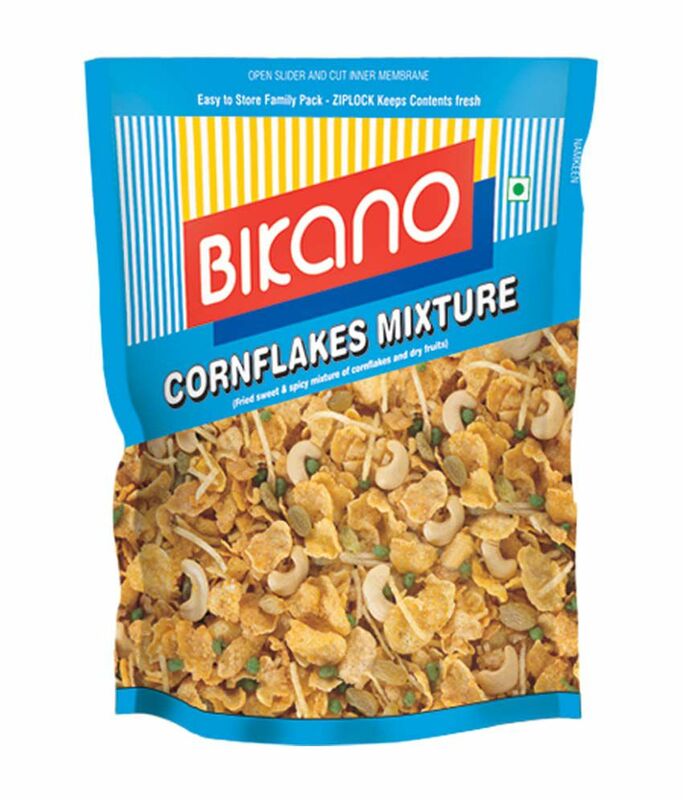 Cornflakes mixture – The sweet and tangy Cornflakes mixture by Bikano is a perfect amalgamation of potato sticks, cornflakes, and dry fruits. Highly rich in minerals, folate, proteins, dietary fibre, and carbohydrates – the mixture is an ideal combination of health and taste! Bhel Puri – This light snacking item is a blend of puffed rice, vegetables and tangy tamarind sauce that tastes amazing. It’s claimed as a low-fat, nutritious and healthy snack and is highly fulfilling. A small bowl of this mixture is enough to kick off your hunger strike and energize your body. 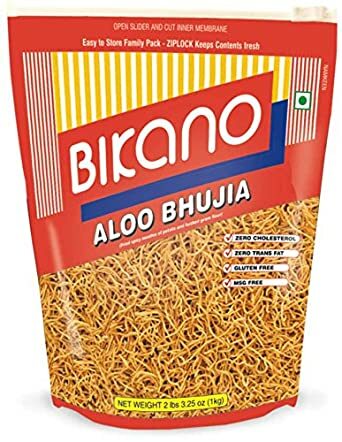 Bikano Sweets and Namkeen brand has always been famed for its delectable taste, lip-smacking flavours and unmatchable healthy snacking options. Each of them is sure to leave you tempted and carving for more and more! Pay a visit to its website and buy namkeens online!